From Okinawa, Japan to the Environmental Design Library, 2nd floor of Wurster Hall. One third the way through the trip. One helluva long way to go. It's good to see familiar faces around. The design studios are hives of activity that I am staying away from. The library is humming, clicks of computer mice intermittent between the shuffling of feet. I actually don't mind the banality of the current scenario. I could use a bit of down time. Rather I have to use this downtime, simultaneously collecting everything I've seen and heard from the second leg of the trip and to prepare for a third excursion. This morning I had coffee with a member of my thesis committee, a professor from the Department of Geography. He was excited to hear of all the latest discoveries but asked that pesky but so important question everyone from my grandpa to my wife has been asking: "So. What are you going to do with all this?" Yes, what am I doing with all of this? For the past week I've been laboring over a travelogue for the walk across Okinawa with an accompanying soundscape and map. But that's just telling the story. I need analysis. Analysis will complete the act of investigation. Editing my sounds completes the act of listening. As my friends are in the final throes of thesis preparation seven floors overhead, I dig away internally at my thesis just barely a fetus. What will it want to be when it grows up? (Will it be a boy or a girl?) What does all this military gestation (the US bases, the DMZ, airport security, etc.) mean for architecture? Likely I will have to sacrifice some threads of research which have been interesting to me (as I have already done--where are my tanks?? ), or at least be crafty enough to integrate them without watering down the thrust of the research. I have a tendency to generalize. But I contend that a successful architectural thesis takes on something so broad, that it doesn't apply to one project but can guide an entire lifetime of work. I am skirting the fence line of Kadena Air Force base. To my left, Okinawa residents live in a neighborhood mixed with US base personnel and their dependents (I see their cars parked in the driveways with the "Y" on the license plate designating the vehicle as non-Japanese.) To my right, the familiar chain link fence. There is a strip of land several feet wide between the base and the road. This is where I walk. The base property line is marked by small concrete stubs a few inches out of the ground. Sometimes this concrete stub is at the fence line, but often it lies several feet beyond. This strip of land I am walking on is actually military property. I am trespassing on a US military base without jumping the fence. But I'm not the only one. I encounter my first example of tacit farming. One veggie garden after another occupies the strip of land. The neat rows of sprouting plants line up like little green soldiers at the fence line, politely waiting for the day they might march across the space enclosed and soak up the Okinawa sun like nothing else has since before 1945. On the other side of the fence, an American runway absorbs an American sun and has from the moment US forces captured Okinawa. 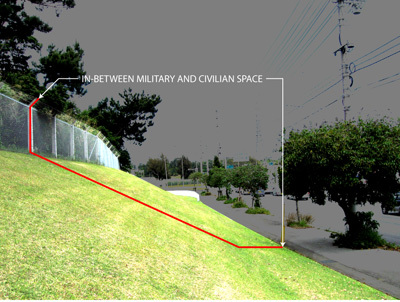 This space between the fence and the sidewalk is an occupiable threshold. It functions locally as a void space to be reclaimed (by farming, etc), and globally it functions as a face of the United States of America. Here we are, look at our power, don't mess with us. The farming is then a silent, peaceful act of resistance. It is a green mustache drawn over the proud, uniformed and saluting mug of the GI. My hunch is that the edges of military bases will continue to provide fruitful research that is not limited to military bases. As architects we are constantly confronted with issues of interior/exterior, negotiating boundary conditions, lines of occupation and of movement through, over, under, and along boundaries. That I can look at something far from the realm of architectural production and be thinking about architecture is encouraging to me. What to do in these spaces could be a thesis project. More importantly, how to look at and draw threshold spaces could become the thesis itself. i always loved this project, there seemed to be so many possibilities...hope to take it up some day. Going by your photos alone, I would say that the "rigidly programmed, controlled interior" landscape exists on the public side, while the "wild and woolly" exists on the miltary base side. I'd be careful in assuming that thresholds necessarily imply a division between interior and exterior. In a (purely physical) architectural sense, most thresholds divide different parts of the interior (from one room to another). In a theoretical sense, thresholds become much more ambiguous in their ability to operate as a division. The Fake Estates project is a great precedent for void spaces--particularly in how to represent them, of how to make the invisible visible. 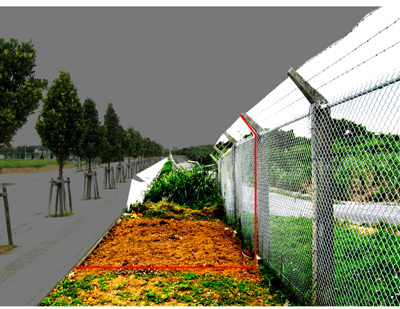 Matta-Clark's zoomed-in photos of the property edges are particularly potent, demonstrating the physical presence and even decay/ambiguity of the property line. If I remember correctly, a number of the lots were impossible for Matta-Clark to access without trespassing, being complete islands within an urban block. There again is another relationship to a military base. The opposite of what I say is often the truth. You're right, the photos depict a regimented civilian "exterior" and a jungle-like military "interior". I have a host of photos which show the opposite, but perhaps it is more interesting to look at ways in which the military space is left in decay or to return to the 'wild', even in currently occupied bases. Furthermore, interior and exterior may shift depending on the position of the viewer. 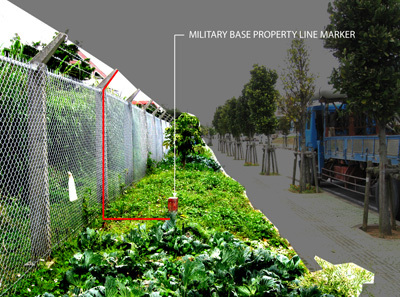 Military bases are exteriors to the greater part of the Okinawa population, not having access but also facing a boundary which is international and exotic.